Iron Chef Jose Garces offers burgers for every taste at this spot. For the carnivores, there’s the Whiskey King, featuring foie gras and applewood bacon. To step up the decadence, opt for a side of duck-fat fries heaped with a mound of slow-cooked short ribs, then blanketed in a rich beer cheddar sauce that Michael Symon likens to homemade Cheez Whiz. Rather skip the meat? 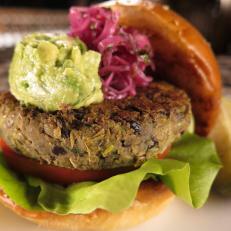 Order the Veggie Burger, with its delicious combo of black beans and lentils smothered with guacamole.